A Walk In KLCC Park. Starting point : Isetan KLCC outsite entrace, Kuala Lumpur Malaysia. Main attraction: Petronas Twin Towers, KLCC. Download Route One Path One Satellite view picture. Lost in Kuala Lumpur route one path one will take you a journey from point 1 (red retangle) Isetan KLCC to point 20 (red retangle) KLCC Public parking. Isetan located inside Suria KLCC building. 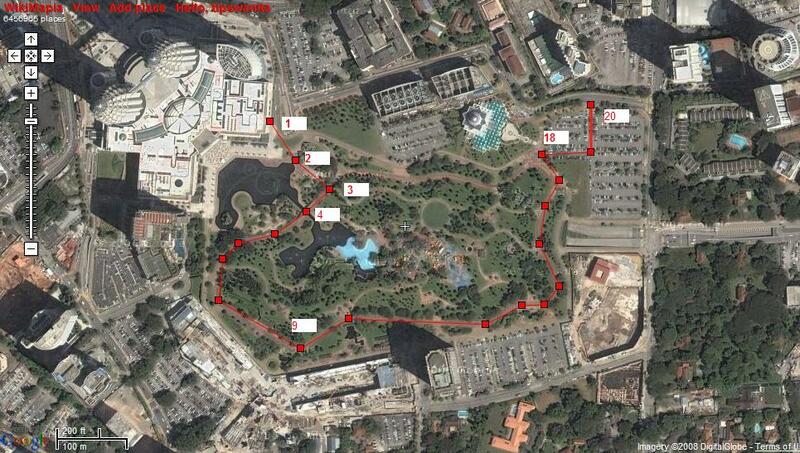 Please take note, each red retangle in Route One Path One Satellite view picture represent points to be followed. From point one walk to Point 2. Point 2 is the security office near the water fountain. From point 2, You need to walk along the fountain and climb the staircases until reaching point 3, a jogging track. continue walking to Point 4 is a bridge. Point 4 is the best point to take Petronas Twin Towers pictures. Walk along the jogging track until you reach point 9. This is the best position to capture pictures of Kuala Lumpur Convention Centre. Continue walking until point 18, exit to a small door gate till you reach point 20.